You are never going to be able to compete with the sublime flavour of a traditional field grown strawberry if you intend to to grow your strawberry plants in a pot or container. However there is one clear advantage to pot grown strawberries that must be taken very seriously. Ripening strawberries are a magnet to slugs and snails and if you don't have effective protection in place then prepare yourself for a crop riddled in slug-shaped holes. In fact the name 'strawberry' arose from the long-established production method designed to deter the damage from slugs and snails, the practice of growing strawberries on beds of straw. The main benefit of pot grown fruit is that they can be moved away from areas of high risk and also take copper bands which will prevent slugs and snails from climbing the pot and reaching the fruit. 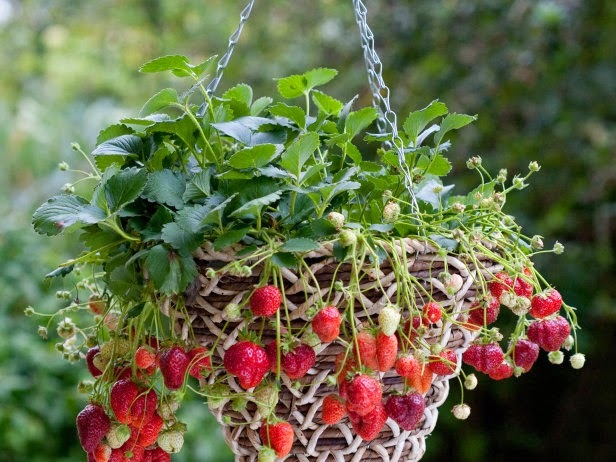 Luckily, strawberries are well-suited for growing in pots, containers and even hanging baskets making them an ideal crop for anyone with limited space. Now this is the important part. Container grown strawberries will not have the flavour of field grown fruit as they do not have access to the full range of macro and micronutrients found in organic-rich soils. Strawberries need this full spectrum of nutrients in order to produce the the very best flavour. 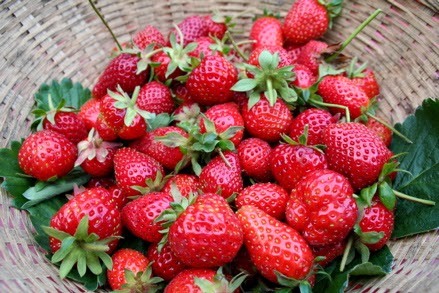 Be that as it may, pot grown strawberries will still taste better than than shop bought fruit and can be improved further with good production techniques. 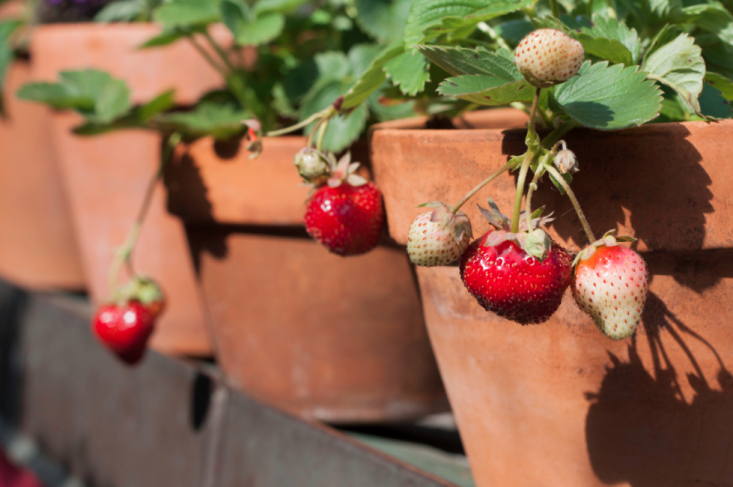 A 12" container is suitable for three strawberry plants, any more and the competition for light, limited nutrients and water will ultimately reduce cropping. Plant strawberries using a rich soil-based compost such as John Innes 'No.3'. Ensure the basket is not filled to the rim, as you will need an inch or so gap left watering, and do not plant the strawberries deeper than they were in their original pots. Mixing in a controlled release fertilizer such as osmocote will provide sufficient macronutrients for the first few months. Once planted move to a sunny position, and then alternately feed on a weekly basis a high potash, liquid soluble fertilizer, and on the opposite week a liquid soluble seaweed-based fertiliser to help provide essential micronutrients. Do not allow the compost to dry out and equally do not allow the compost to become water-logged for long periods of time. Consider incorporating some water-retaining granules into the compost before planting as this will reduce the risk of drying out over the summer. Check the compost daily in hot weather and water if the top half-inch of compost feels dry. Traditional hanging baskets will require more watering than porous terracotta pots, and in turn, porous pot will need more water than glazed. Just before the fruits begin to ripen, you may need to cover your strawberries with some suitable netting otherwise you risk your precious crop from being eaten by ravenous birds. As they strawberries grow they may produce ‘runners’ which are trailing stems with young strawberry plants along the length. These should be removed from early summer onwards to help direct energy into flowering and fruiting.